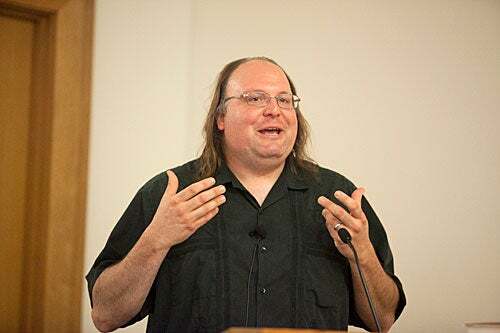 “My fear is that our tools are not promoting diversity,” said Ethan Zuckerman during a launch party for his book "Rewire." Zuckerman is a former Berkman Fellow and now director of the MIT Center for Civic Media. Whether in the real or virtual worlds, said Zuckerman, “We have a talent for finding people with the same socioeconomic background or racial background. But this tendency to flock may be keeping us from finding the information we need,” and the tools we’ve built for the Internet only enhance our flocking bias. “My fear is that our tools are not promoting diversity,” said Zuckerman, whose appearance served as a launch party for his book “Rewire.” Personalization tools “want to give you precisely what you want, to make you comfortable” and ready to buy things, he said. “The danger is that we may be driven into small circles of the same content,” a sort of digital self-segregation into echo chambers where none of our assumptions get scrutinized. What we need, Zuckerman told a large audience at Harvard Law School, are bridges to cognitive diversity, including people who can effectively explain differences. Escaping our digital echo chambers is vital, said Zuckerman, “because the really interesting problems today are global in scale,” requiring international coordination and openness to diverse perspectives. Escaping our digital echo chambers is vital, said Zuckerman, “because the really interesting problems today are global in scale,” requiring international coordination and openness to diverse perspectives. Zuckerman pointed to climate change. “You need to be talking to people in China and India” about climate change as they balance economic growth with environmental sustainability, he said. Simply localizing the problem won’t work. How then should people manage their tendency to seek out like-minded folk? First, they need to track their behavior for the presence of flocking bias. Zuckerman showed a graph exposing his own Twitter “follow bias”: Only 27 percent of the people he follows are women. “This is an embarrassing slide,” Zuckerman said, “but now when I follow someone, I think about” the follow bias. He said people need to be self-reflective about their media-consumption preferences, and push back against them. “I know that left on my own, I’d spend all my time reading cute cat macros on Reddit” or constantly consuming news about his beloved Green Bay Packers. People need tools that correct for bias and “engineer serendipity,” allowing them to engage with content they didn’t even know existed. As Zuckerman explained, “Sometimes you need the things you didn’t know you needed to know.” Having tools that promote serendipity can make that happen. Zuckerman believes that change is possible. “If we don’t like how the Internet works now, we can fix it.” He recommended, for example, his own Berkman project called Global Voices, which shares online content from around the world. “It’s incumbent on us not to be satisfied with our tools,” and to build new ones that correct for our blind spots, he said. 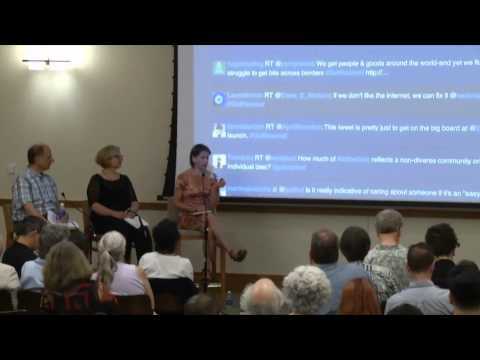 After Zuckerman’s talk, David Weinberger, Judith Donath, and Ann Marie Lipinski took part in a panel discussion. Donath, a Berkman Faculty Fellow, explored the “weak ties” of online relationships on social media such as Facebook: “These questions around global connectivity that Ethan is raising aren’t just questions of being global. It’s the question of how we pay attention to others at any scale,” she said. 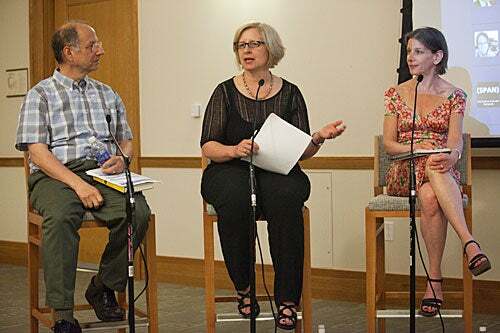 After Zuckerman’s talk, David Weinberger, Judith Donath (right), and Ann Marie Lipinski took part in a panel discussion. Lipinski, curator of Harvard’s Nieman Foundation, explained how “we still face the equivalent of border fences in our daily interactions.” It isn’t just barriers of language and culture that divide people, she said, but a lack of desire to understand others. “It’s possible that our current technological capacity to connect outpaces our capacity for empathy,” she said. David Weinberger, senior researcher at the Berkman Center, agreed. “The Internet has presented us with an opportunity [to connect], and we have not seized it,” he said. Citing an example from “Rewire,” Weinberger pointed to the urban planner Jane Jacobs, who championed a style of city design “to engineer encounters and engagement” in ways that promote diverse communities. “I certainly favor structuring serendipity,” said Weinberger.